The rate at which consumers are behind on their mortgage payments by 30 days or more slipped in March to the lowest levels seen in more than three years. 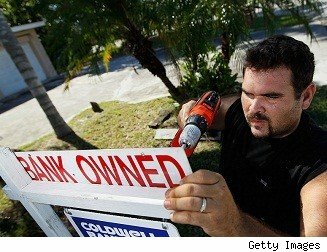 The total value of all mortgage payments that were at least 30 days delinquent slipped to less than $500 billion in March, a level not seen since January 2009, and there were 49.5 million outstanding first mortgages during the month, according to the latest statistics from the credit reporting agency Equifax and Moody's Analytics. The latter number was a drop of close to 11 percent from the more than 55 million observed in March 2008. "The residual effect from the recession and housing bust continues to be an obstacle for both lenders and borrowers in the housing market," said Equifax chief economist Amy Crews Cutts. "We're seeing effects of the economic recovery within existing accounts in the form of fewer delinquencies and foreclosures, but not a substantial amount of new activity as home sales and resulting new home financing fail to keep pace with payoffs and foreclosures." In all, mortgage balances were 3.5 percent less than they were during the same month last year, and the nation has seen year-over-year declines in these balances for each month in the last three years, the report said. Currently, 71 percent of all delinquent first mortgages are on loans that were taken out between 2005 and 2007. Meanwhile, fewer consumers are falling behind on their mortgages for the first time than at any point in the last several years, the report said. For instance, the number of loans that transitioned to delinquency from being current in March slipped to the lowest level seen since June 2007. Similarly, the number of mortgages that shifted from 60 to 90 days past due-indicating severe financial difficulties for homeowners-is at the lowest level observed in nearly five years. Loans that are 90 days or more past due, or which have entered the foreclosure process, have fallen steadily in each of the last 24 months. In the last year or so, millions of consumers have found themselves on more sound financial footing and are therefore in position to begin making more on-time payments into not only their mortgages, but also their credit cards and other outstanding bills as well. Can Obamacare Keep Debt Collectors Out of Hospitals? Is Mobile Wallet Technology Secure?